The head louse, or Pediculus humanus capitis, is a parasitic insect that can be found on the head, eyebrows, and eyelashes of people. They can also be found in the bedding or clothing of infested persons. Head lice feed on human blood several times a day and live close to the human scalp. Head lice are not known to spread disease. What are symptoms of head lice? Itching of the scalp and/or neck is the most common symptom of head lice. 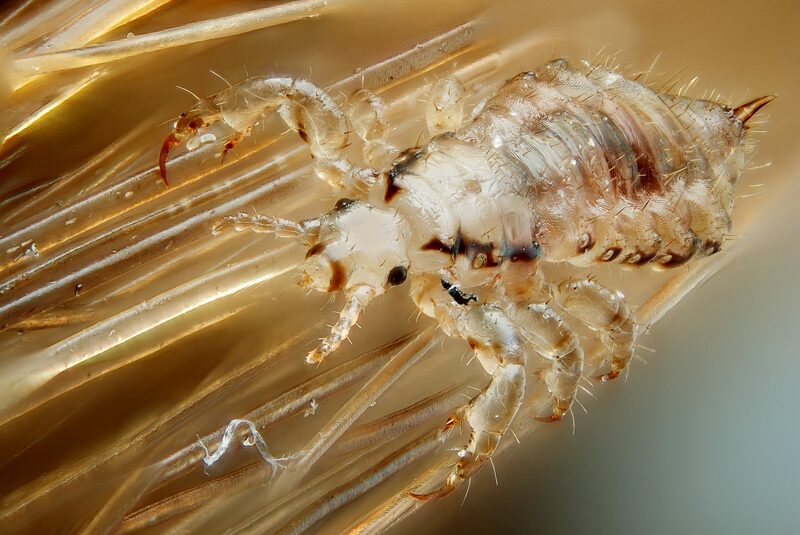 You may also observe crawling lice in the hair, and/or eggs (nits) “glued” to hair shafts, especially behind the ears and at the base of the neck. Contrary to popular belief, lice do not jump, hop or fly. Lice are spread by direct person-to-person contact. They may also be spread by sharing personal items with an infected person, such as combs/brushes, clothing, bedding and headphones. Lice do not spread to or from pets. Off of a person, lice survive less than 1–2 days and nits cannot hatch and usually die within a week. Is there a way to avoid head lice? It’s important to note that pretreatment with lice shampoo will not prevent someone from getting lice. However, there are a few things you can do to try to prevent getting infested like avoid sharing personal items and storing personal items in close proximity to someone else’s – such as sharing a locker. Put hats and gloves inside coat sleeves for storage. Check your child’s head often. If one member of the family has lice, all family members should be checked, but only those with lice should be treated. How do I treat head lice? Never send children to bed wearing a shower cap. Do not re-wash hair for 2 days after treatment. Apply lice medicine according to the instructions (long hair may require 2 bottles). *Avoid using conditioner before treatment and do NOT leave medication on longer than recommended. Have the infested person put on clean clothing after treatment. Comb dead and any remaining live lice out of the hair using a fine–toothed nit comb. Use nit comb again every 2-3 days for 2-3 weeks to be sure all lice and nits are gone. You may wish to wash clothing, bed linens, and other items that the infested person wore/used during the 2 days before treatment using the hot water (130°F) cycle and dry using high heat and soak personal items at the same temperature for 5-10 minutes. If, after 8–12 hours of treatment, no dead lice are found and lice seem as active as before, the medicine may not be working. Do not retreat until speaking with your health care provider; prescription medication may be necessary. Do not use fumigant sprays; they can be toxic.